If you have enough fans, there is a website that will always remember your birthday — no Facebook notifications required. Famous Birthdays, founded in 2012, has emerged as a valuable discovery platform for the social media industry. It includes more than 150,000 pages, each one dedicated to a public personality, whether he or she is a content creator, actor, athlete, entrepreneur, or some other type of “famous” individual. Peruse those pages, and you’ll discover the obvious interesting tidbits about well-known figures (in addition to their birthday, of course). On a recent trip down the Famous Birthdays rabbit hole, I learned I share a birthday with one-time Vine heartthrob Cameron Dallas and YouTube star Joe Sugg. I found out gamer Jacksepticeye holds a degree in hotel management. It came to my attention Jake Paul just turned 21 on January 17. I’m sure he celebrated with a nice, quiet affair. As with other detail-oriented websites (looking at you,TV Tropes), a single visit to Famous Birthdays can result in hours of fascinated clicking. The platform’s founder, Evan Britton, has referred to it as “Wikipedia for Generation Z,” and it currently reaches more than 18 million unique users per month. Creators and their fans have become so concerned with their standing on Famous Birthdays that the brand itself has gathered its own measure of celebrity. Social media standouts like Baby Ariel (pictured above) visit its offices to say hi. Given how strongly Famous Birthdays has woven itself into the fabric of Gen Z and the social media stars that cohort follows, one might assume that Britton and his team had impressive foresight about upcoming cultural trends when he decided to launch his website back in 2012. In truth, however, Famous Birthdays didn’t discover the social media world — the social media world discovered it. By gleaning insights from its internal search bar, the platform connected with Gen Z users who made their passions clear and indicated that they wanted their own database of celebrity facts. 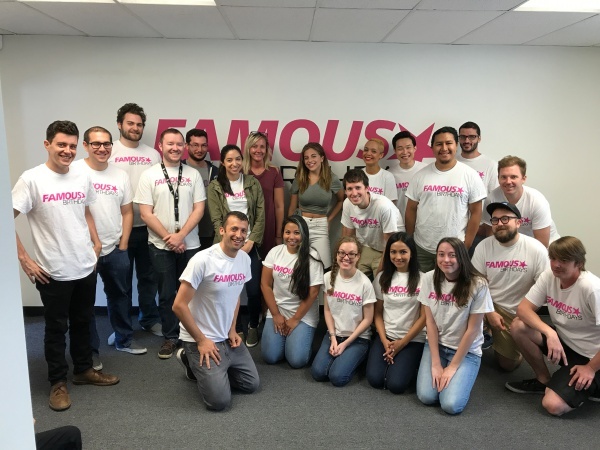 By serving that need, Famous Birthdays has found a space it can grow into, to the point that it is making its own explorations in the world of content creation. Famous Birthdays first launched as a platform on which visitors could find fast facts about the traditional media superstars who were most familiar to people like Britton. The company’s office featured pictures of Denzel Washington, Tom Hanks, Derek Jeter, and Rihanna. The plan was to drive engagement by encouraging fans of these celebs to submit information about them and by grouping them together based on their shared biographical data, such as their dates of birth, first names, or professions. 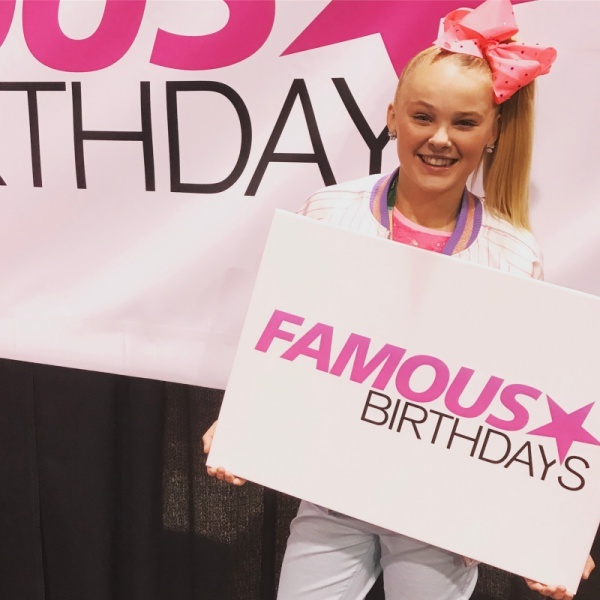 Social star Jojo Siwa at the Famous Birthdays booth at VidCon. In order to learn who its users are clamoring to learn about, Famous Birthdays relies on a single valuable tool: its internal search box. Like many other websites, Famous Birthdays lets its users look up the stars they seek in order to get to their desired factoids faster. The searches that fail to return an active page reveal important information to Britton and his team. Those misses show the stars whose fans are currently demanding a closer connection but are unable to find it elsewhere, and those celebs are the ones who are likely to get their own Famous Birthdays pages in the future. “Unmatched searches are our roadmap in terms of who or what we need to put on our platform,” Britton said. He explained that those searches represent “pure user interest,” independent of subscriber counts or follower numbers. And so, with its internal search box as its guide, Famous Birthdays continues to stay ahead of the curve. When fans start to organically demand a profile, whether it be for an actor in a Netflix show, a band, or an Indonesian Musical.ly star, Britton and his team learn who will be the next big thing. It is Famous Birthdays’ ability to stay up to date on trending social media stars that gives it clout in that community. Some celebrities who end up on the site view inclusion as a “badge” or “status symbol,” and they often link to their Famous Birthdays page in their Twitter bio, Britton said. Those who have not yet received profiles of their own often reach out to Famous Birthdays in hopes of turning up on the site. 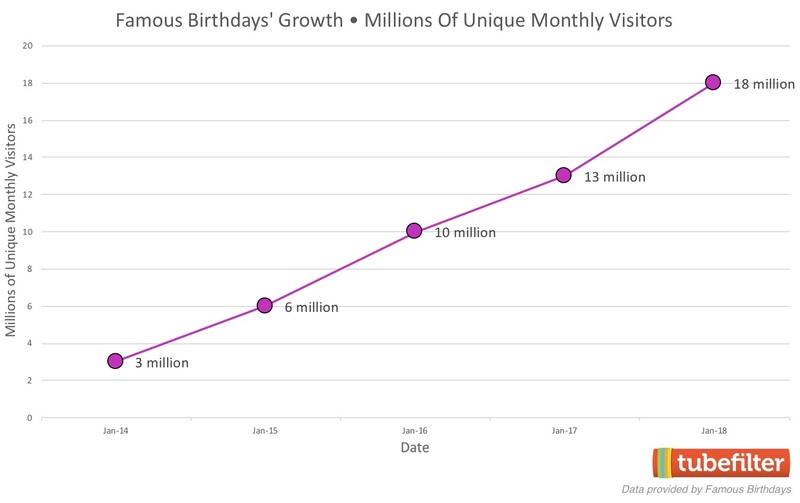 As creators clamor for Famous Birthdays attention and implore their fans to boost them up the leaderboard, one big winner is the site itself. 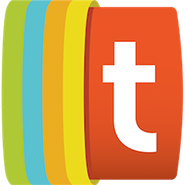 Its internal search is currently used 500,000 times per day. New profiles are added regularly, covering everyone from handball players to beauty pageant contestants. Famous Birthdays now counts 22 full-time employees and also works with about a dozen freelancers. Several of its staff members crowdsource updates submitted by fans, in order to ensure a high level of factual accuracy. When a creator breaks up with a significant other or launches a new venture, his or her fans are quick to alert the Famous Birthdays team. Britton said his site looks over 1,000 pieces of new information each day. The next stage of the company’s growth involves its own content operations. On Twitter, Famous Birthdays offers well-wishes to celebrities, but on platforms like YouTube and Instagram, its presence is much more complex. There, it provides support for the stars who have reached the upper echelons of its sitewide ranking. YouTube star Annie LeBlanc, for example, is listed as the third-most popular profile on Famous Birthdays. Recognizing the passion of her fans, the site live streamed one of her concerts on its Instagram page, and posted additional concert clips on its YouTube channel. Famous Birthdays will soon have another chance to follow a top influencer on the road. Jacob Sartorius, who holds the site’s number-one spot, will begin his Left Me Hangin’ tour on January 18, with creators like Hayden Summerall and Zach Clayton in support. Ten of the resulting shows will be live streamed on the Famous Birthdays Instagram page. Musical.ly star Baby Ariel hangs out with the Famous Birthdays team during her visit to the company’s office.